﻿ Public or Private Blockchain? Which blockchain technology to Choose? 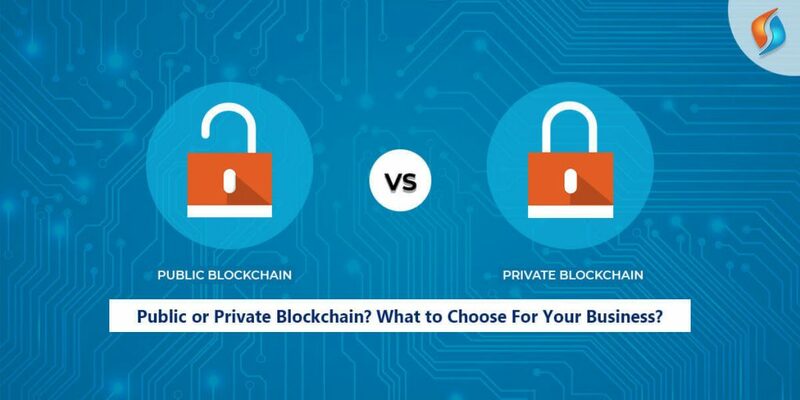 Public or Private Blockchain? What to Choose For Your Business? Businesses are choosing a distributed ledger blockchain technology depending on speed, cost, and security. Public Blockchain that is very common, allows anyone to participate and are transparent. It is an original intent of blockchain technology, to create a distributed network in which individuals can see and directly control economic activities. Private Blockchain needs an invitation to join, generate a growing network among organizations that are eager to conduct business with specific members. They are also popular among businesses that need faster transaction needs. Private Blockchain is faster as the number of participants in the ledger is limited. And additionally, the cost of storage is lower than the public blockchain. More and more organizations are confused about opting between the two as the number of blockchain expert developers are focusing on speed and privacy issues. A business’ decision will depend on its goals – is it looking for the openness that a public blockchain offers? Or looking for a more private environment? The latter one is best suited for the organizations that are looking for a specific than a wide-ranging purpose and want to exert control over the transactions. Blockchain application development companies are all set to offer decentralized peer-to-peer network depending on a community or their utility basis. Public Blockchain suits for an organization when their business requires more transparency to gain the trust of customers. But the organizations that prefer anonymity should go for private blockchain. For example, a pharmaceutical company may find a private blockchain app development better off. Since they pass through the supply chain from manufacturer to the distributor funnels. Public Blockchain is the model in use by Bitcoin, Litecoin, and Ethereum. It is essentially considered to be the original distributed ledger structure. This kind of blockchain development services are open and anyone can join the ledger, and also can be edited by anyone present on the system. Every node in the system has as much transmission and powers as any other, making the public blockchain not only decentralized but also fully distributed. To make the transaction valid, it should go for authorization by every constituent node through the consensus process. Once the authorization takes place, we can add the record to the chain. This kind of blockchain app development has incentives to encourage the peers to join the network as well as authenticate the transaction. The biggest disadvantage is its complete openness. This kind of transparency offers very little or no privacy for transactions and has a weak concept of security. Another disadvantage is the substantial amount of computing power needed for the maintenance of the ledger. With so many nodes and transactions, this type of network requires a lot of efforts to achieve consensus. On the other hand, Private Blockchain is important for forks of the originator but finds its deployment in a permissible network. In order to gain access to the private blockchain, one has to gain the invitation first. And then, gets the validation by the network starter. Once we have the acceptance of the invitation, the new component can contribute to the maintenance of the blockchain in a closed network. This offers the benefit of the blockchain technology solutions, but, not necessarily have the distributed characteristics of the public blockchain. The network starter can only determine the extent to which the entity can view or validate transactions. A typical way for a business to use private blockchain is intra-business. It ensures that only organization member can only have the access. This is useful for only those businesses who don’t want anyone outside the organization to be a part of the chain. Thus, it is possible to restrict the data to certain individuals on requirement basis. With only a few people being part of the chain, the ledger is quicker and more efficient with an easier consensus process. If the enterprise chooses to more found public blockchain or rest assured with higher security measures to private ones. Then, we are still available with the option to tame the capability of blockchain technology. As the security capability of public blockchain becomes stronger, their value will further increase. Thus, making the use of private blockchain less essential. And when it comes to restricting the access to a specific group of individual, it is just not possible to ignore the private blockchain. In the end, the decision to choose depends on the kind of utility of the organization. Data can lie on multiple blockchains. Whether it is public, private, or permissible, with any number of unique characteristics can include voting power, visibility permissions, or any other customized options. One can tailor the private blockchain according to specific data needs. Business can enforce more stringent policies that can go for implementation in a public blockchain ledger. Hire our outsourcing team of expert Blockchain developers who will allow your organization to fully leverage the blockchain ecosystem, whether it is public or private. Along with this, we can also drive the potential to combine both public and private blockchain with innovate solutions. This will accomplish cross-chain exchanges and offer greater compatibility. Make the best choice with us and leverage the benefit of blockchain app development for your business needs.